To prepare for the new 777X, Boeing is radically retooling major pieces of the assembly process for its big widebody 777. Despite a slowdown in the production rate, it can’t stop the assembly line, so adding and subtracting equipment requires a complex choreography. Boeing is radically revamping how it will build the 777 widebody jet — a plane that still earns it vital profits despite a slowdown in sales and production rate, so it can’t afford to stop the factory while it retools. An exclusive tour of the 777 line this month revealed a complicated manufacturing dance under way to solve this logistical puzzle. The remodelspansthree assembly bays inside the giant factory and will replace massive, decades-old fixtures with new, more flexible equipment. 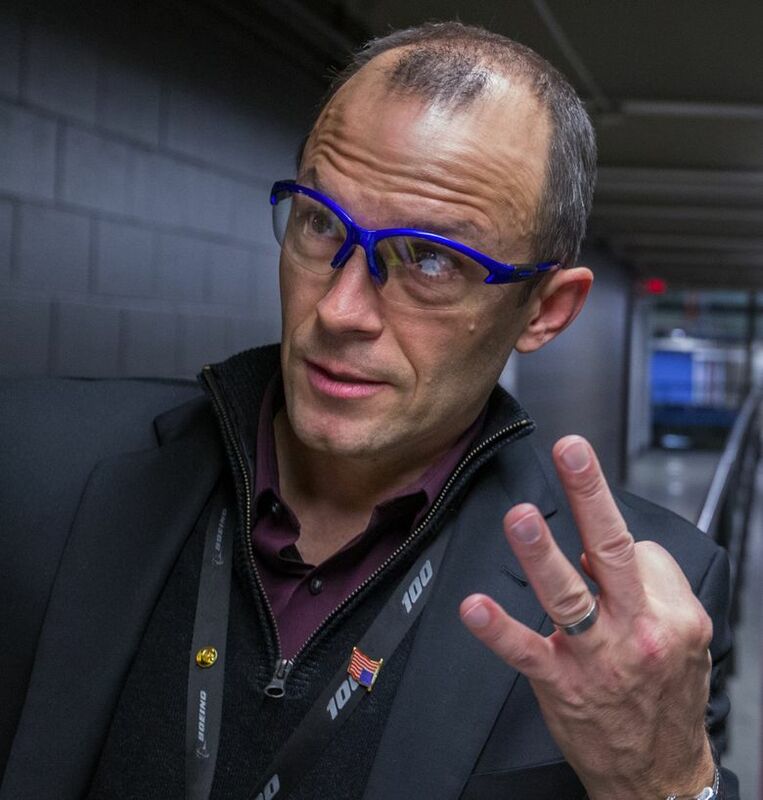 Jason Clark, vice president of 777 operations, brimmed with energy as he described the chess-like moves he’s making around the assembly line that churns out the current 777, spurred by the need to get ready for the forthcoming 777X model. So wide-ranging is the revamp that in one assembly bay, construction crews are busy digging up the old concrete floor and installing systems underneath a new 6-foot slab. Clark pointed to the remaining patch of newly uncovered soil, where engineers had unearthed anchor beams from the static-test airplane on the original 747 jumbo jet. “That dirt hasn’t seen the light of day since 1968,” he said. In about a year, Boeing will begin building the first 777X, which has a carbon-fiber composite wing. Longer and a different shape from the current jet’s metal wing, that wing won’t fit on the fixture that joins the metal wing to the jet’s body. So Clark’s engineers are setting up and testing new, flexible equipment that can handle any wing size or shape, progressively removing the old equipment, then shifting the new into the spaces vacated by the old. Despite the looming production-rate cut next summer, all this extra work should stave off some of the job losses on the 777. • A new way to complete 777 metal wings. • A new flexible system for joining the wings to the fuselage body. • A planned new, temporary 777X final-assembly line. • And an entirely new, highly automated system — designed and built by Mukilteo-based engineering firm Electroimpact — for assembling the 777X’s carbon-fiber wings. This last piece is almost a replica of the composite-wing assembly setup Airbus has in its wing plant in Broughton, Wales. The impressive restructuring of 777 final assembly is separate from the setup of the adjacent $1 billion plant where Boeing will fabricate the 777X’s carbon-fiber wings, which give the new plane a wingspan nearly 23 feet longer than the current model. Meanwhile, Boeing is also working on the not-yet-smooth introduction of a new robotic method to assemble the 777 fuselages in another building on the site. Though designed to accommodate the 777X and its giant carbon-fiber wings, the new production system is being introduced now for the current 777 with metal wings in order to fix any bugs in advance of the new jet’s debut. About 80 to 100 current-model 777s will be built on the new system before the first 777X shows up, Clark said. In the first piece of the puzzle, the metal wings are already being completed in a totally new way. Mechanics formerly finished the wings by installing the control surfaces and engine pylons while perched high on the slanted deck of a monumental fixture where the wings are joined to the center-fuselage section. This month, mechanics began completing the wings at ground level, able to walk around the 106-foot-long structure as it rests on hydraulic jacks that raise or lower it to provide access. The wings now arrive complete and “fully stuffed” with all systems for joining to the center-fuselage section in that big monumental wing-to-body join fixture. And already the next phase of the 777 plan is under test in the adjoining bay that formerly housed the extra “surge” line for the 787 Dreamliner: a new way of doing the wing-to-body join. Boeing is testing a system with the completed wings each supported by three giant jacks. In computer-controlled unison, these move the wings along the floor into the attachment position next to the center-fuselage section, which sits on its own jack. Once both wings are joined to the fuselage, the center jack is withdrawn, and the whole thing is supported only by the six jacks under the two wings. This center-fuselage-with-wings section then pulses forward along the ground to the next station in final assembly, the jacks again moving the whole thing in unison. Just before the holiday break, a faded center fuselage — retrieved from an old Japan Airlines 777 in a desert scrapyard — sat atop its jack for tests of this system. Graffiti were scrawled in large, crudely painted letters across its side: “Not a production part” — as if there were any doubt. Clark said his team is ready to bring in a wing and do a check that everything fits during the Christmas production break. When that system is perfected, able to handle any size or shape of wing, in about 18 months the old wing-body join fixture will be dismantled and torn out, Clark said. Beyond the new wing-support jacks in this same bay, where the floor is being dug up, is where Boeing will put an initial 777X final-assembly line for production of the first couple of dozen aircraft. Clark said this initial low-rate production line will be up and running in about a year. It will be used to get 777X assembly running smoothly, without slowing down production of the current 777. By 2020, this temporary line will close, and both models will go down the main 777 line, complete with its new wing-to-body join system. 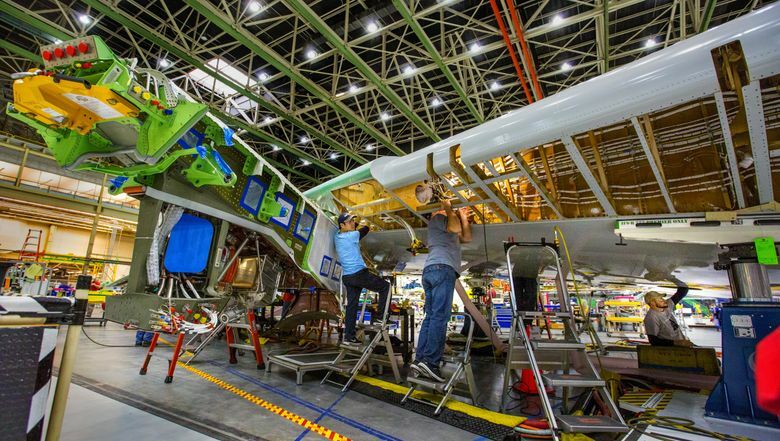 When the temporary line is scrapped, that same bay is earmarked for the most dramatic innovation in the building: the plan to assemble the jet’s carbon-fiber wings. But because that bay is full until then, Boeing is setting up the composite wing-assembly equipment in another temporary location, taking up 150,000 square feet one more bay over. From a balcony there, the four Electroimpact automated wing-assembly stations look eerily similar to the Airbus A350 composite-wing-assembly setup, also designed by Electroimpact. Just as in Wales, the wing skin panels, spars and ribs are positioned and slid into a drilling and fastening cell where an Electroimpact robotic machine suspended from a gantry moves across the wing, fastening it together. “The industry is starting to centralize around what’s the best technology,” Clark said, comparing the convergence to what happened earlier in the auto industry. One difference from the Airbus system, he said, is Electroimpact has designed it to be movable. It’s bolted to the floor but will be uprooted in 2020 and moved to the bay where that 1968 dirt is being dug. Offering grounds for optimism that this 777 transformation will go well, Boeing has already successfully completed a similarly bold remake of the 737 production system in Renton to prepare for the 737 MAX, which should deliver ahead of schedule next summer. Yet there’s also the less successful introduction of robotic assembly of the 777 metal fuselage in a building next to the main Everett assembly plant. Teething problems there have resulted in the robots damaging irreparably at least one fuselage panel, and progress in getting the system up to production rate has been slow. However, Clark said the team has learned from each glitch and made adjustments. “We’re not completely out of the woods yet,” he acknowledged. But he expects that in the first half of 2017, the new system will be rolling out 777 forward- and mid-fuselage sections at full rate, with aft-fuselage sections to follow by year end. “The 777X gets the benefit of all that learning,” Clark said.